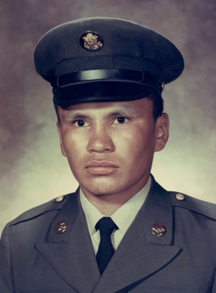 Patrick Michael Gurneau (Grenade), age 69, is a member of the Red Lake Nation. Patrick was born on March 16, 1950 in Red Lake, Minnesota to Alice Gurneau and Leroy Whitefeather of Redby, Minnesota. He began his journey to the spirit world on March 16, 2019 from Silver Hills Hospice Center in Las Vegas, Nevada. Patrick enlisted in the Army as a young man. He entered the Jump School at Fort Benning Georgia and received his wings as a US Army Airborne Trooper. Patrick’s assignment led him to become an elite member of the 82nd Airborne Division located at Fort Bragg North Carolina. This duty included an assignment as Honor Guard for the United States of America. This meant he was always active in trouble spots throughout the world and would jump from airplanes onto foreign soils. His duty included service as an 11Bravo Airborne Trooper during the Vietnam War. Patrick was an avid runner and traditional powwow dancer. He is remembered for having a positive outlook and for generously helping everyone who asked. He liked to tell funny stories and to play Keno. Upon his discharge in 1972, he spent many of his working years with America’s National Cemeteries and worked at Fort Snelling for many years before being transferred to the National Cemetery at Las Vegas, Nevada. Family welcoming Patrick to the spirit world are his mother Alice, his father Leroy, his grandparents Felix and Flora, and aunts and uncles. He leaves behind his sisters Karen Gurneau of Minneapolis and Marilyn Gurneau of Mille Lacs, and his supportive friend Lynn Dauphinais of South Carolina. A pipe ceremony for Patrick will be held on Wednesday March 27th at 6:00 pm followed by a wake service. Funeral Service will be held on Thursday March 28th at 11:00 am. All to be held at Gichitwaa Kateri Church, 3045 Park Ave, Minneapolis, Minnesota. Burial will be in the Fort Snelling National Cemetery on Thursday March 28th at 1:15 pm.